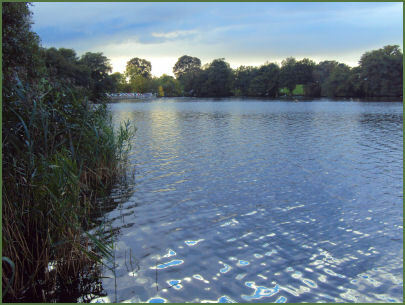 Attractive Redesmere lake at Capesthorne, near the village of Siddington is around half a mile in length and is used for sailing. The sailing club is located on the lake's the eastern shore. The name Redesmere is believed to mean a marsh or a lake at a reedy place. 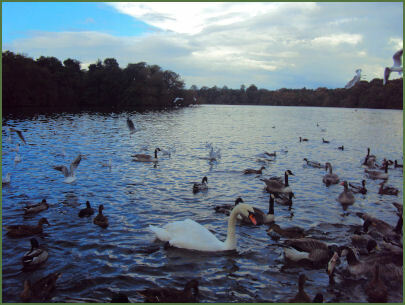 Redesmere is a man made lake which was constructed in the eighteenth century as a feeder lake for the ornamental lakes of Capesthorne Hall. There is a small promenade and parking area at the southern end of the lake, which can be accessed just off the main A34 road. The lake is a haven for aquatic birds, Bird life frequently observed at Redesmere include moorhen, mallard, Canada geese, grey heron, moorhen, mute swan, tufted duck, coot and great crested grebe, while pochard, ruddy duck, shoveller, and goldeneye and kingfisher can occasionally be sighted. Some rare species , such as smew have also been known to visit. Resident species in the woodland include chaffinch, nuthatch, treecreeper, wren, great spotted woodpecker and both little and tawny owls. Local tradition tells the legend of the floating island on Redesmere lake, the story concerns a young knight , who was one of the aristocratic Bromley-Davenport family, owners of Capesthorne Hall and nearby Macclesfield Forest, suspected his fiancee of being unfaithful and swore that he would have nothing more to do with her until the island on Redesmere lake moved. Soon after the knight was stricken with a serious illness through which the lady attentively nursed him. While he was recuperating from his illness a violent storm arose which ripped the island from its roots and swept it across the lake. This was taken as a sign that his fiancee had never been unfaithful, after which, so the story goes, he married her. The legend was later converted into a ballad. Reports state that a floating island of around one and a half acres in size once existed at Redesmere, which used to move around the lake in high winds. The island consisted of peat and vegetation that it actually had trees growing on it. Apparently it grounded itself on the east bank of the lake, where it still remains. Old ordinance survey maps do record the island located in a different positions. Footpath to the lakeside, free parking and a picnic area. The Redesmere Fete takes place the last Saturday in July, from 1.30pm to Midnight, and begins when the Waterlily Queen is rowed across Redesmere in her swan-shaped boat for her coronation. The fete continues at Siddington Village Hall right through to midnight. Follow the A34 south from Alderley Edge. Redesmere lane is on the left about 1km after Capesthorne Hall.